Whether you are a retailer, or you work with retailers, The Retail Owners Institute makes it easy for you to get a quick financial health assessment of any retail business. Choose any one of the 55 retail segments listed on this page, and click the link. Once on that "Retail Segment" page, see Retail Benchmark Trend Charts, available only from The ROI. Immediately see whether - and if so, where - you need to make adjustments now to achieve the results you want. "Lead time" is one of your most valuable assets. Use our Owner's Dashboard Trend Form to put time on your side. "Wow! There's a lot here. Where should I start?" Take the fast track! Use the 3-in-1 Kit Manage Profits, Open-to-Buy, & Cash Flow, on your own. FREE, unlimited access for ROI Members! Know more • Save more • Do-it-yourself! When you want do-it-yourself financial help and know-how, The ROI is here for you...24/7. Owners: Have Questions? Want Answers? We get it. There is a lot of how-to information here at The Institute. And sometimes, you just "need to know it now!" So, we've put together some "Know It NOW!" Bundles. In just 90 minutes or so, you can be up-and-running! This great value gives you what you need to know, saves money, and best of all, saves time! Watch • Listen • Practice • Do It Yourself • Know It NOW! Easy and fast for you. And very helpful for us! Just 4 questions. Will take you about a minute. 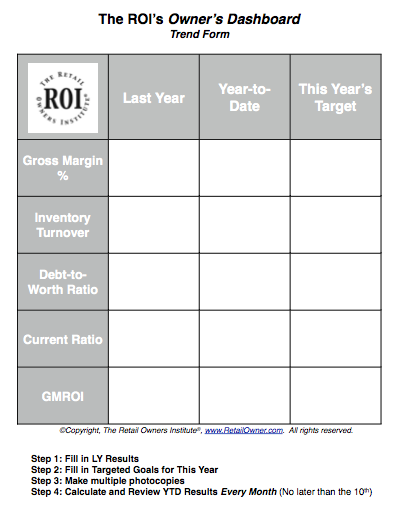 Check off which parts of The ROI site you've used - the Benchmarks? Calculators? Courses? How-to articles? Whatever. Then, check off what you think about it! Need to Know It NOW! Thanks very much! We appreciate your input.